Sage is the common name for any of the plants comprising the genus Salvia, and in particular is used for Salvia officinalis, known as true sage, common sage, meadow sage, or garden sage. When used without modifiers, sage generally refers to Salvia officinalis; however, it can be used with modifiers to refer to any member of the genus. This genus includes shrubs, herbaceous perennials, and annuals. The common name, "sage," also is applied to similar plants in the closely related Perovskia and Phlomis, which are also in the mint family, Limiaceae. For example, Russian sage is the name applied to Perovskia atriplicifolia and Jerusalem sage refers to Phlomis fruticosa and other species of Phlomis. Some species of the unrelated genus Artemisia are also referred to as sages, a shortened version of sagebrush, which is a more appropriate term for them. Smudge bundles are made with various gray-leaved species of Artemisia and are misrepresented as "whitesage" smudges. The true white sage is Salvia apiana, which has a delightful scent when burned. Sages provide value for the ecosystem and for humans. Different species of sage are grown as medicinal plants, culinary herbs, and as ornamental plants. Some, such as the white sage or sacred sage and divine sage or diviner's sage (Salvia divinorum) also have a history of usage in religious ceremonies. Ecologically, sages provide food for various animals, including providing pollen and nectar to various pollinating bees, wasps, moths, butterflies, and hummingbirds. Salvia species are used as food plants by the larvae of some Lepidoptera species including the bucculatricid leaf-miner Bucculatrix taeniola, which feeds exclusively on the genus, and the Coleophora case-bearers C. aegyptiacae and C. salviella, both of which feed exclusively on S. aegyptiaca. The Salvia genus is a member of the mint family, Lamiaceae. Plants in this family are frequently aromatic in all parts and include many widely used culinary herbs, such as basil, mint, rosemary, sage, savory, marjoram, oregano, thyme, lavender, and perilla. Some are shrubs, but rarely trees or vines. The leaves emerge oppositely, each pair at right angles to the previous one (called decussate) or whorled. The flowers are bilaterally symmetrical with 5 united petals and 5 united sepals. Many members of the family are widely cultivated, owing not only to their aromatic qualities, but also their ease of cultivation: These plants are among the easiest plants to propagate by stem cuttings. The Salvia genus includes about 700 species. The stems are usually square and the plants have paired, opposite, simple leaves that tend to be oval or lance-shaped, with toothed margins or deeply cut segments (Taylor 1986). The flowers appear in whorls, with two to many flowered clusters and arranged in terminal spikes or racemes (Taylor 1986). True or common sage, Salvia officinalis, is native to the Mediterranean and has been used for centuries for its culinary and medicinal values (Herbst 2001). Sage has been grown in central Europe since the Middle Ages (Hamilton 2007) and is now also naturalized in North America (Longe 2005). The genus name, Salvia, is variously attributed to derivation from the Latin salveo, meaning "to heal," or salvus, meaning "safe," or salvare, meaning "to save." These are considered indicative of the common sage's highly regarded healing properties. An ancient proverb states: "Why should a man die who has sage in his garden?" (Hamilton 2007) The name officinalis is attributed to the sage being included on official lists of medicinal herbs (Longe 2005). The ancient Greeks used Salvia offinalis to treat consumption, ulcers, and snake bites. The Egyptians used it to treat the plague (Longe 2005). The Ancient Romans considered common sage to be a sacred herb and harvested it by means of an elaborate ceremony whereby a special knife would be used (one not made of iron since it reacts with the sage) and the sage gatherer would wear clean clothes, have clean feet, and offer a sacrifice of food before he could begin ( Hamilton 2005). The Chinese also were quite partial to this herb and Seventeenth century Dutch merchants found that they could trade one chest of sage leaves for three of their teas (Hamilton 2005). Sages also are used by several Native American cultures. The leaves and [[root]s of the lyre-leafed sage or cancerweed, Salvia lyrata, was used by Native Americas as a salve for sores and in tea form to treat colds and coughs (Longe 2005). Salvia divinorum, known as divine sage, which is native to Mexico, has been used for centuries by shamans in healing rituals to achieve altered states of consciousness (Longe 2005). 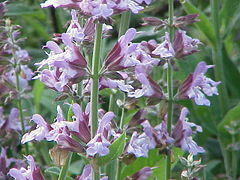 The clary sage, Salvia sclarea, received its name because of its traditional use as an eyewash (Longe 2005). Common sage, Salvia officinalis, is a small evergreen subshrub, with woody stems, grayish leaves, and blue to purplish flowers. It is native to the Mediterranean region, but is now naturalized throughout Europe and North America (Longe 2005). Common sage, which is known by various common names (garden sage, meadow sage, true sage, kitchen sage, dalmatian sage) is much cultivated as a kitchen and medicinal herb. Common sage is also grown in parts of Europe, especially the Balkans for distillation of the essential oil, though other species, such as Salvia triloba, may also be harvested and distilled with it. In southern Europe, related species are sometimes cultivated for the same purpose, and may be confused with the common sage. White sage, Salvia apiana, also known as sacred sage, is an evergreen perennial shrub that is native to the southwestern United States and northwestern Mexico. It is found mainly in the coastal sage scrub habitat of Southern California and Baja California, on the western edges of the Mojave and Sonoran deserts. 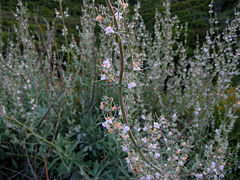 White sage is a sub-shrub that is less than 1 meter tall. The leaves are widely lanceolate and tapered at the base. The margin is minutely toothed and rounded. The leaves are generally basal, covered with dense hairs, which gives it a white coloring, and are about 4–8 centimeters long. The inflorescence is a spike-like clusters with few flowers. The flowers are bilateral, about 12–22 millimeters in length, and are white with lavender spots and streaks. Both the stamens and styles are exserted. The fruit form into shiny, light brown nutlets that are 2.5–3 mm in size. Bumblebees, hawk moths, and wasps pollinate the white sage, and hummingbirds also appear to like the plant. Salvia arizonica—Arizona sage, Desert indigo sage, a purple-flowering annual. Salvia azurea—Blue sage, Azure blue sage; very big bright blue flowers. Salvia candelabrum—a blue-flowering scented sage. Salvia carnosa—a blue-flowering annual, native to the Arizona desert. Salvia clevelandii—Blue sage, Cleveland sage, Fragrant sage. Salvia columbariae—Chia, Chia sage, California chia. Salvia guaranitica—Anise sage or hummingbird sage. Salvia hispanica—the Chia of commerce. Salvia leucantha—Mexican bush sage, velvety spikes of violet-purple and white, 3' tall. Salvia lyrata—Lyre-leaved sage, Lyreleaf sage. Salvia mexicana—Mexican sage, medium blue to violet and lavender, 8' to 10' tall. Salvia polystachya—Chia sage, Chia seed. Salvia pratensis—Meadow clary or Meadow sage. Salvia sclarea—Clary or Clary sage. Salvia spathacea—Pitcher sage or Hummingbird sage. Salvia viridis (syn. : S. horminum)—Painted sage. Several types of Salvia are used medicinally. Common sage (Salvia officinalis). Although the effectiveness of common sage is open to debate, it has has been recommended at one time or another for virtually every ailment and has been used as general tonic (AHS 2007; Longe 2005). There is some experimental evidence for its effects as an antihydrotic (antiperspiration), antibiotic, antifungal, astringent (shrinkage of mucous membranes or exposed tissues), antispasmodic (suppresses smooth muscle contraction), estrogenic (helps to regulate menstruation), hypoglycemic, and tonic (AHS 2007). Longe (2005) notes that taken cold, sage tea is astringent and diuretic, and it will reduce night sweats in menopausal women, and taken hot a sage infusion acts as an expectorate and is good for the flu and common colds. The antibacterial properties of the common sage make it useful as an mouthwash for gingivitis and is listed in the United States Pharmacopoeia as a treatment for sore throat and bleeding gums (Longe 2005). In a double blind, randomized and placebo-controlled trial, sage was found to be effective in the management of mild to moderate Alzheimer's disease (Akhondzadeh 2003). Longe (2005) considers it to act as a carminative (antispasmodic activity that is used against cramps of the digestive tract in combination with flatulence) and calms the nervous system and possibly reduces anxiety. The strongest active constituents of common sage are within its essential oil, which contains cineole, borneol, and thujone. Sage leaf contains tannic acid, oleic acid, ursonic acid, ursolic acid, cornsole, cornsolic acid, fumaric acid, chlorogenic acid, saponin, caffeic acid, niacin, nicotinamide, flavones, flavone glycosides, and estrogenic substances (AHS 2007; Longe 2005). Sage also is high in calcium, and provides potassium, magnesium, zinc, vitamin C, and the B vitamins. This species is the famous whitesage of smudge sticks, a type of incense. White sage is believed to cleanse a space of any evil spirits that may be present. This power is said to be released from the plant by the burning of the leaves, which are typically bundled into a wand or stick. Today many Native American tribes still use the stems and leaves for smudging as part of purification ceremonies. Pineapple sage (Salvia elegans, old: S. rutilans). Pineapple sage is a tender perennial with pineapple-scented leaves. Medicinally, this is perhaps closest to the scented geraniums, a sweet-smelling Pelargonium species. Red sage (Salvia miltiorrhiza). 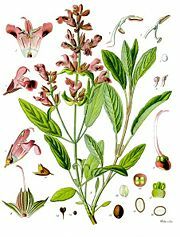 Red sage is used medicinally in Traditional Chinese medicine. Chia sages. The seeds of these species are used as bulk laxatives, much like the seeds of Psyllium (Plantago spp.) or linseed. Chia has been important in the diet of desert Indians. It is still used for its mucilaginous qualities by Mexican natives. Divine sage or Diviner's sage (Salvia divinorum). Diviner's sage, also called Yerba de la Pastora or sometimes just Salvia, is a plant that differs from all the other sages. It is a Mexican visionary herb and there is some evidence it is a true cultivar. It is known to have strong psychoactive properties and has been used by shamans to achieve altered states of consciousness (Longe 2005). As a herb, common sage is frequently used in dishes containing pork, beans, cheese, poultry, and game stuffings, as well as to flavor sausages (Herbst 2001). It is considered to have a slight peppery flavor. In Western cooking, common sage is used for flavoring fatty meats (especially as a marinade), cheeses (sage derby), and some drinks. In Britain and Flanders, sage is used with onion for poultry or pork stuffing and also in sauces. In French cuisine, sage is used for cooking white meat and in vegetable soups. Germans often use it in sausage dishes, and sage forms the dominant flavoring in the English Lincolnshire sausage. Sage is also common in Italian cooking. Sage is sauteed in olive oil and butter until crisp, then plain or stuffed pasta is added (burro e salvia). In the Balkans and the Middle East, it is used when roasting mutton. Akhondzadeh, S., M. Noroozian, M. Mohammadi, S. Ohadinia, A. H. Jamshidi, and M. Khani. 2003. Salvia officinalis extract in the treatment of patients with mild to moderate Alzheimer's disease: A double blind, randomized and placebo-controlled trial. J Clin Pharm Ther 1(28): 53-59. Applied Health Solutions (AHS). 2007. Sage. Applied Health Solutions. Retrieved September 7, 2007. Hamilton, D. 2007. Sage: Salvinus officinalis. Selfsufficientish. Retrieved September 7, 2007. This page was last modified on 2 April 2008, at 15:44.